Reformation Sunday (last Sunday in October) is a full celebration of music! Both worship services feature our choir and the Big Thomspon Brass Quintet, led by trumpeter Mark Manges! Music is a major part of our worship experience here at King of Glory and not just music but a variety of both traditional and modern Christian worship music. We celebrate God’s love for us through old Lutheran hymns as well as Dixieland jazz. 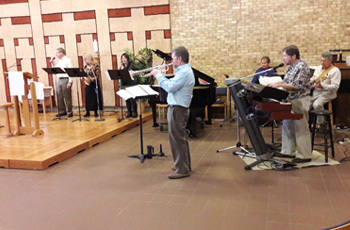 Our liturgies include country and western, rhythm and blues, Celtic, jazz, evening prayer, as well as contemporary and traditional Lutheran liturgies. If you have any instrumental music talent, we urge you to contact Mark Manges to find out how you might fit into our next worship experience. All of these liturgies require lots of different voices. We could always use more singers to join in our special church services (contact Mark Manges) or to be song leaders during our regular services. The Glory Singers Choir meets at 7:00 PM on Wednesday evenings through the school year and welcomes all who love to sing! Contact the Choir Director or the church office. If you are interested in participating, please contact us here, or call the office at 970-669-5983 during normal business hours.